Ashly Audio started out in pro audio manufacturing building reliable analog mixing consoles to meet the demands of the burgeoning live music industry. Now, over 40 years later, Ashly is returning to the market equipped with decades of experience building powerful, easy-to-use digital signal processors that pair seamlessly with control technologies that users are able to navigate intuitively. 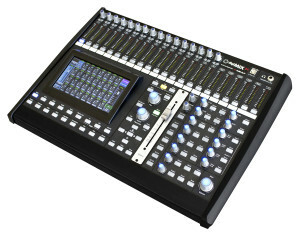 The first product in the range is the Ashly digiMIX24, a versatile, compact 24-channel digital mixing console with professional inputs/outputs, integrated signal processing and effects, iPad® Remote Control integration, user-friendly software, and intuitive mixing via the live control surface. The Ashly digiMIX24 is ideal for worship and educational facilities, auditoriums, gymnasiums, performance spaces and project studios. The Ashly digiMIX24 features 24 inputs (including 16 Class-A mic/line inputs); up to 14 mix buses (configurable in many useful ways); 8 Aux outputs, 8 channel inserts; 33 channels of dynamics and equalization processing; and 2 stereo effects processors with reverb, delay, chorus and more. Its intuitive control surface pairs with a seven-inch LCD color touchscreen, intelligent metering, and motorized faders. The system management software makes it easy to save, load, or copy mixer setups. Optional, field-installable cards provide either Dante™ connectivity or a USB interface for easy multi-track recording or playback. Like all Ashly products, the digiMIX24 is covered by the company’s industry-leading five-year warranty.